Brili is the ultimate system to help families with children stay on task and on time every day. Easy setup, guidance, rewards, voice prompts and real-time monitoring: it's got it all. Real-time activity guidance for kids and monitoring for parents. Visual, audible and even spoken voice prompts help kids stay on task. 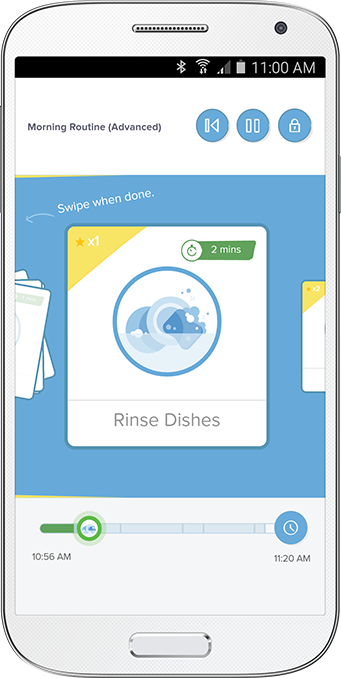 Brili's Parent Mode lets you set up routines and monitor progress from anywhere – in real time. Use Brili on all your family's devices with one account. View and advance routines from anywhere – they're always in sync. Kids earn free times and star rewards for completing tasks. Track progress over time as kids practice their routine activities. Brili Extra offers actual vs. estimated time charting on all tasks. Experts love Brili, but have a look at what parents are saying! Experts know structure and consistency set kids up for success—especially when learning or behaviour challenges such as ADHD or autism spectrum disorders are present. Brili founder Pierre Séguin and his son faced similar challenges. After extensive consultations with psychologists and behaviour experts—and through trials of existing solutions—two things became clear: that routines can be hugely successful and; that the tools available at the time just didn’t do enough. So he and his team created Brili—the first interactive platform that guides kids through everyday routines—employing best practices of game design and child psychology. It’s fun for kids, simple for parents, and takes stress away from families.